Blog Chattanooga Is #1 For Allergies, How Does This Effect Teeth? Last week at the Chattanooga Area Dental Society meeting Dr. Marc Cromie from the Chattanooga Allergy Clinic spoke to us. It was very interesting to hear him talk about allergies and how it affects us here in Chattanooga. We live in the Tennessee Valley where it ranks #2 in the world for high pollen count. #1 and 3 are in China, and #4 is Knoxville. Trees are the main cause of allergies in the springtime. The trees send out heavy pollen, and we can look forward to our cars having that yellow dust on them soon. Many call Chattanooga the allergy capital of the United States, and it is for good reason due to the mountains and valleys and a wide variety of trees that emit pollen we have a perfect storm so to speak of allergy irritants. A high pollen count is considered anything above 120, that is 120 parts of pollen in a 3×3 foot cube of air. In Chattanooga, we routinely hit 9000!!! It is common to see 3000 and 1800. It is so thick you can actually see it. 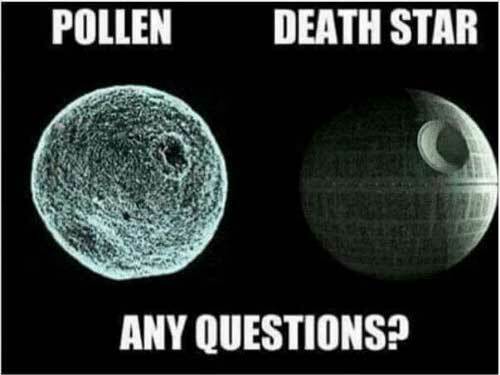 Dr Todd Levin of Chattanooga Allergy Clinic says that grass pollen look like the Death Star from Star Wars. The reason our allergies act up during the spring in Chattanooga is because of the trees. Then we go to grass in the summer as the major source of allergy problems. In Chattanooga, we get a final season of ragweed! Mold will also send out spores around the same time. Allergic reactions, including seasonal allergies, are the result of our immune systems going into overdrive in response to these allergens. One of the main causes of dry mouth is the medication for allergies. Sudafed specifically! Sudafed is great for drying up our noses and sinus, but it also makes our mouths dry. Many people are on a medication or two that cause dry mouth already, and when they add in some Sudafed, it can make their dry mouth downright unbearable. The high pollen count can also trigger asthma. Steroid inhalers used to treat asthma can cause an imbalance in our mouths. This can lead to an overgrowth of yeast and give a condition known commonly as “Thrush.” “In my patients that use steroid inhalers, I recommend brushing your teeth immediately AFTER the inhaler is used. If you can’t brush immediately then eating or drinking can help prevent thrush from occurring.” Symptoms of thrush are things like white appearance and a burning mouth. We have simple treatments for thrush let us know immediately if you have any of the symptoms. Catching it early can help it go away sooner. A good sinus infection can mimic the symptoms of a toothache. When pollen counts are high we see many people for toothaches only to find they really have a sinus infection. The opposite can be true as well, you could think you have a sinus infection, and it can really be an abscessed tooth! Sinus infections are caused by bacteria and viruses, not pollen directly. Pollen, molds and other allergens can help us get sinus infection by providing an environment that is favorable to the bacteria and viruses. Such as a clogged nose, or a stuffy head, then bacteria can set up shop and grow colonies and next thing you know you have a full on sinus infection. Because the most prominent allergens in Chattanooga are airborne (such as pollen, and mold spores), avoiding allergic reactions can be difficult, but there are a few things you can do. It is best to stay indoors when pollen counts are out of this world in our beautiful city. Trying to limit our time outside when the pollen count is above 120. You should also wear a pollen mask while doing yard work, and avoid using window fans that could blow pollen and spores into your house. If you are prone to allergens, take some preventive medicine such as Allegra, Zyzal, Zyrtec. These medications are now over the counter and are considered non-drowsy formulas. Sudafed can help dry up a runny nose and prevent a sinus infection by not keeping such a great environment for those bad bacteria and viruses. Make sure you also take the anti-allergy medications your doctor or allergist recommends to minimize your congestion. Staying hydrated will help keep you from getting dry mouth. As the weather heats up, it is easy to find yourself dehydrated this time of year. Also chewing some sugar-free gum containing xylitol will help keep your mouth moist and anti-cavity saliva flowing. 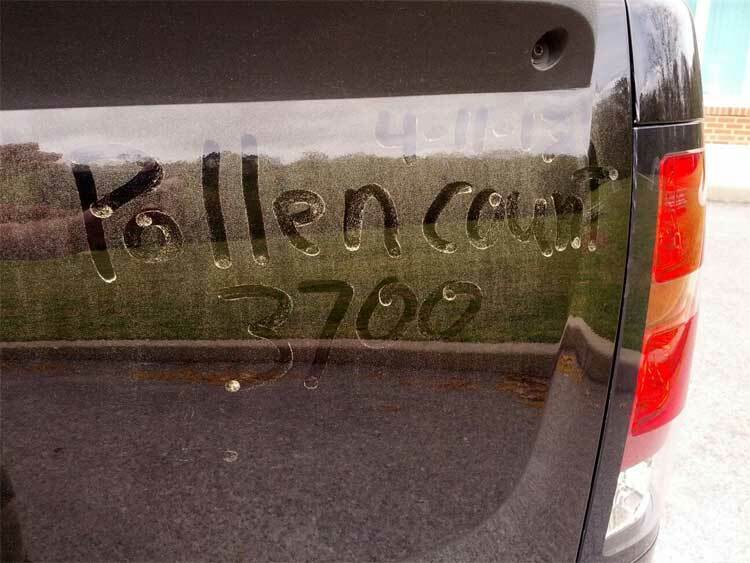 Dr. Mark McOmie’s car last year in April when the pollen count was 3700. Dry mouth can lead to decay, leading to crowns, root canals, and losing teeth entirely. Dental implants can even be lost due to dry mouth. Thank you for putting your trust in McOmie Family Dentistry in Chattanooga! Give us a call 423-899-1112. We love our patient and want to do all we can to keep you healthy happy and smiling.